Northern pike are found in countless lakes and rivers throughout much of North America, but very few waters hold trophy northern pike. Finding a destination where monster pike are a reality is the dream of many anglers. Here are five top destinations for catching pike in excess of 30 pounds. It is tough to argue with the quality of northern pike water in Saskatchewan. No other destination offers as many opportunities to land jumbo pike. A combination of remote lakes with optimal habitat makes Saskatchewan the top northern pike destination in North America. Arguably the best of the Saskatchewan waters is Wollaston Lake where catching a 50-inch northern pike is a real possibility. Yet, a host of other lakes in the province offer pike exceeding 35 pounds. Among the top lakes to visit are Reindeer, Athabasca and Misaw. However, dozens of Saskatchewan lakes offer exceptional northern pike angling. It is a trek to some of the most northern reaches of North America, but the Northwest Territories offers exceptional angling for monster northern pike. The cold, vast waters of this remote destination provide the perfect habitat for pike 40-inches or larger. Catching a 50-inch fish is certainly a possibility with each cast. The most famous of the Northwest Territories pike waters is Great Slave Lake. Expansive and complex with its many islands, few lakes offer a better shot at catching a northern pike 50 inches or larger. Other premier pike waters include Lac La Marte the Taltson River. Another exceptional Canadian destination for big pike is Ontario. Huge northerns are a way of like in many of Ontario’s remote waters, where 40-inch and larger fish are caught with amazing frequency. Although there are dozens of high quality pike waters in Ontario, one of the top lakes is Lac Seul, where anglers regularly catch fish measuring 40 inches or more. Other notable trophy pike waters include Eagle and Red lakes. South of the Canadian border, the best northern pike angling can be found in Minnesota. The state holds numerous waters renowned for their monster pike. If you are looking for a northern measuring 40+ inches, this is the place to go. One of the best waters to fish in Minnesota is Rainy Lake, located on the Ontario border. This is lake is carries a reputation for holding a high population of big northerns, and anglers regularly hook fish in the 40 to 50-inch range. The northern reaches of Minnesota holds many top-notch pike lakes, but among the others you should target are Lake of the Woods, Lake Vermilion and the lakes of the Boundary Waters Canoe Area. 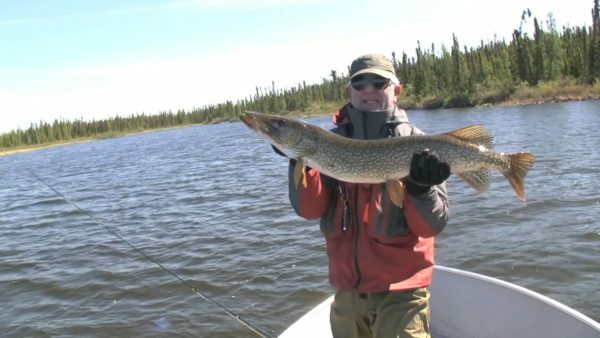 As with its neighbor the Northwest Territories, Alaska offers some of the best northern pike fishing in North America. Many of the top pike waters are tough to get to, but the effort is worth it for a shot at fish measuring 50 inches or more. The Yukon River is among the best of Alaska’s pike waters, but hooking up with an experience guide can lead you to some of the best pike action you will ever see.